Fruit-machine slots are widely popular for a reason. Everyone loves familiarity and reminiscing over the first slots they played. Fruity's are simple and can bring some exciting cash rewards. Playson brings you yet another fruit slot in the form of Super Burning Wins which has 3 reels and 5 paylines. Super Burning Wilds is bursting with juicy vibrant colour. 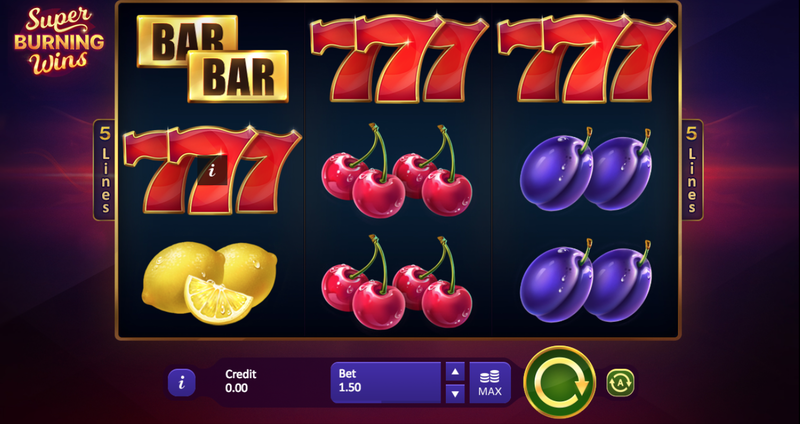 You'll find the typical tasty fruits including lemons, oranges, and cherries, as well as the popular lucky red 7s. 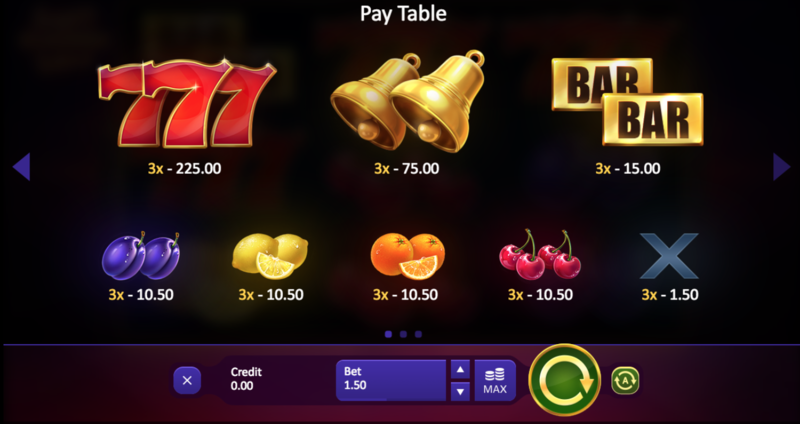 Gameplay is very straightforward with the symbols all offering a range of payouts. The highest paying symbols are of course, the lucky red 7s and these award up to 1, 500x your stake. Play today at Easy. Super Burning Wins is a 3 reel, 5 payline slot by Playson. It has a classic fruit machine theme which takes you back to a simpler time. Gameplay is very straightforward so it's a great one to play if you're new to the online casino world. The audio is upbeat which adds a nice touch. The design is very colourful with lots of bright fruits on the reels. Behind the golden-edged reels, you'll see a very plain dark purple background. There are various fruit symbols including sweet cherries, sour lemons, tasty oranges, and plums. There are also shiny golden bars, big gold bells, and everyone's favourite, lucky red 7s. Fruits - Land 3 of a kind to form a winning combination. The lowest paying symbol is the X and this awards an amount equal to your stake if you land a winning combination. Next are the oranges, lemons, plums, and cherries. These award up to 7x your stake. Golden Bars - The golden bars pay slightly more, awarding up to 10x your stake for landing 3 on a line. Golden Bells - Next are the golden bells. These pay out up to 50x your stake. Lucky Red 7s - The lucky red 7s are the best paying symbols in Super Burning Wilds. These award up to 150x your stake. Covering the entire reel with lucky red 7s will award you a lucky 1, 500x your total stake. 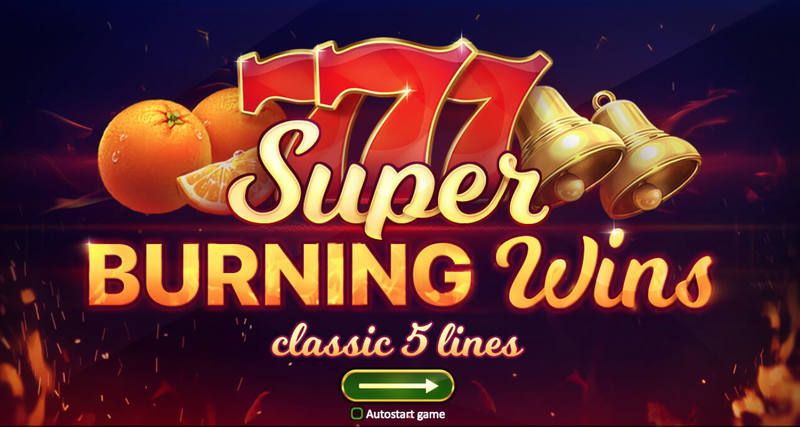 Claim your own casino bonuses to play on Super Burning Wins. Playson is a Malta-based gaming company who has made huge waves in the industry over the last few years. They create social, casino, and slot games with high definition graphics and advanced technology. Their games are designed with players in mind so they always ensure that every game has top-quality entertainment, rewarding features, and innovative designs. If you like to play UK slot game, then you will like Super Burning Wilds. It's nothing fancy, but if you like simple games this could be a winner. Gameplay is straightforward and the design is simple and colourful. Unfortunately there is no free spins feature in this slot, however, the lucky red 7s offer a tasty reward of up to 1, 500x your stake.